Kanyon's discovered the value of boxes in the mail since they most likely include presents. I brought home two boxes last week and immediately he was ready to tear them open. This time we made him wait until after lunch. Then as soon as he was finished, he carried two 10 pound boxes from the living room and sat them on the chair in the dining room ready to open the boxes. We got the scissors out and opened the boxes. He immediately saw all the wrapped birthday presents (which we made him wait to open, more on this later) and then found some Toy Story clothes. 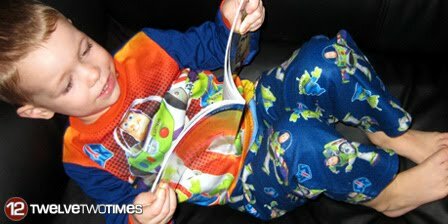 First, he wore a new Toy Story jacket and shirt and then he found the Toy Story pajamas. He insisted on taking off the jacket and wearing the pajamas. And continued to wear the same outfit for three days. We couldn't get him out of it! We put the presents up (but still within Kanyon's eyesight). He made it through nap time without opening the presents. As we were leaving the boys with a babysitter to go to our monthly coffee house event, Kanyon found a way to hold the present and was eager to open it before we left. Since he had been so terrible on previous babysitting nights, we decided that a new toy just might help the situation. So we let him open one. He choose the Caterpillar first because it was labeled for his birthday. Then not 2 minutes later, he was back ready to open another present, Corbin's car. So we caved in a let him open this one too. Both Corbin and Kanyon were happily playing on the floor when we left for coffee house. When we returned home, Kanyon brings me a new book. Where did he get this book? Apparently while we were gone, Kanyon convinced the babysitter to allow him to open both the other birthday presents as well. I'm sure he had a blast opening the presents. It must be great to be a curious little boy!